In Sharna’s case, I think her hint means she’s definitely IN – after last season I don’t think she would be coy if there were any doubt. And if there is doubt? Bad move, girl. As for Val – I don’t think there’s any way in hell he won’t be on, with Maks and Derek gone and Mark making noise. No way. And he’s saying yes, he is back. Read more..
Hi all!! Decided to start a new post because the other one was getting cluttered and would be hard to read for anyone coming back for the first time in a while. Click to read the old post. I was watching GMA at the beginning and they teased nothing – which means I have to wait until they go to the first commercial. Boo. ETA: Vogue here! GMA just said the announcement was soon coming. Will Derek Hough be back, they ask? We will soon find out!! ETA: I’m back! They just teased it again, not mentioning any single pro, but showing Cheryl and Drew. ETA4: Okay, there are four pros in studio. I’m guessing Cheryl and Mark. Not sure of the other two. And then they show a child photo of Karina – I take it as she’s IN. They showed Maks/Meryl, Derek’s Ameska Macy’s and Cheryl/Drew – clues. ETA6: Cheryl is in Studio and competing. Tony is in studio. Karina also in studio, along with Val. Switch up is back. Results show the first two weeks. Len gone for part of season. There will be some “guest judges”. COMMERCIAL/Local News Break. ETA7: Next…Mark Ballas. See below for the rest. Can’t say I’m happy Derek is back. No vacay for Heidi. 🙂 I was typing as I went and just realized no Sharna. Kinda devastated about that. Also, no Gleb in the pro lineup despite his wife’s tweet. He must be back in the troupe. The starting positions below are based on the individual pro’s status last season. Troupe is still unknown. Read more.. 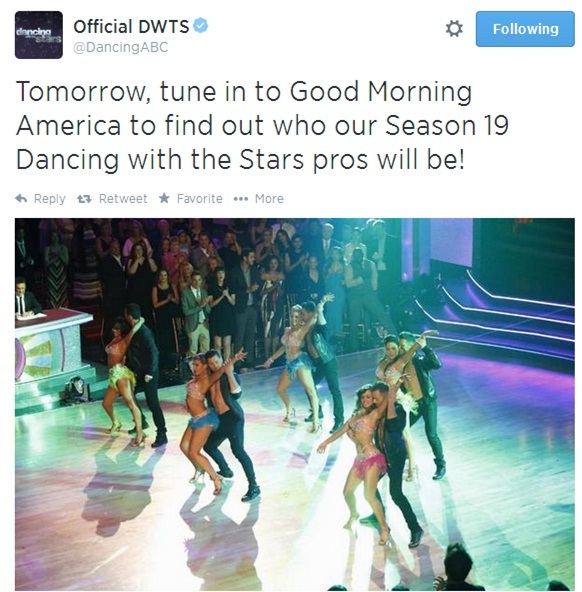 Dancing with the Stars Season 19 – PRO WATCH!! Dancing with the Stars Season 17 – PRO WATCH!! It’s that time of year once again, boys and girls – time for Pro Watch. 🙂 I’m starting it a bit earlier than normal because we’ve gotten confirmation about Derek and a maybe about Maks earlier than ever before, as I recall. While Derek often knows very early, he’s not usually big on sharing – that seems a bit different this year. He’s confirmed he’s back with both the LA Times and Access Hollywood when they asked him. Now, it’s possible that this could just mean he’s open to it, not that he has a partner, but I suspect if he wants to do it, he gets to do it. Also, at the TCA Summer Tour, Paul Lee, the ABC President of Entertainment, was asked about Maks and he gave an answer that was interpreted by differently by different outlets. No shock there. Access Hollywood said he said Maks “may well be back” and TV Guide said he said “likely” be back – now, call me crazy, but those are actually different interpretations. So, I am going with “maybe likely” as a happy medium. Particularly after last season, when Maks himself was saying he was back and then he wasn’t. And sorry Maks fans – it’s not a sure thing because, contrary to your world view, the ratings didn’t actually go down because Maks wasn’t there – they have been on a constant downward trend for a few seasons now, including those when Maks was present. We’ve been writing about it for a few seasons now, including after All Stars which was down 20% from season 14 – Maks was on both seasons. Sixteen was lower again = downward TREND. As for the rest?? Well, Lizzie was asking who we wanted Val to dance with this season, but that could well be a “if we talk like it’s true it will become true” PR style. I suspect he’ll be back though. I wouldn’t count on Gleb or Louis…and maybe not even Tony. I really think they need to give Henry a shot, and I expect that both Mark and Tristan will have spots. As for the ladies, I suspect that Cheryl and Karina, and possibly Sharna, are the only sure things. Everyone else seems like they could go either way. The big question mark for me?? Will there be a troupe?? I suspect there will be, although we won’t see them nearly as much early in the season. Don’t worry, Troupe fans – if what Paul Lee says about a possible return to two shows a week in the spring is true, then all may not be lost. ETA1 Vogue here with an UPDATE: According to Enstarz, Val Chmerkovskiy will be dancing in Dancing With The Stars Season 17. He not only told them he will be dancing, he also told them his dream partners as well as saying, “I just want a partner who is willing to work and has a strong work ethic” and “You can be a supermodel, an actress, an athlete… but to be a good partner, you have to be willing to put in the work.” Be sure to read the link for more! ETA2: Chelsie could be “possibly in”. See this post for more details!! ETA3 Vogue here again: Due to this tweet by Sharna, we suspect she might be “possibly in”. ETA4 Vogue again: After discussing this with Court and the way she read Sharna’s tweet, we’ve decided together to take out “Possibly In” for Sharna. The pros may be posting optimistically looking forward to season 17 (or the craziness of it, etc), but, that doesn’t mean they are “in” or are “possibly in”. ETA4: This is sad. I hate to even report this, but, according to US Weekly, Kym Johnson won’t be dancing this season. She tells the magazine, that she has an “amazing work opportunity back home in Australia.” More here. Thanks to Lori for the heads up. Also, Chelsie tweeted of receiving “good and bad news”. We have no idea what she’s referring to, but, we’re changing her status to “unknown”. ETA5: Karina is IN per @DWTSGossip! ETA6: @DWTSGossip is also reporting Peta, Cheryl, Tony, Val, and Mark “in” as well. ETA10 Vogue: DWTSGossip is reporting Sharna is also “in”! She’s also reporting via twitter that she knows for a fact Sasha is not a Pro “as of now”. @Dwtsgossip writes to us that Sasha may very well still be in the running. Also, Tristan and Gleb are not confirmed yet. ETA11: Oksana is out via Val’s twitter. Though the tweet has now been deleted. So, we’re going to mark her as “possibly out”. ETA12: Just a little update on Troupe member Julian Tocker. He has tweeted that he won’t be dancing full time because of the new format, but, we’ll still see him around. Sad as it makes you wonder if it will be the same for some or all of the troupe members? Also, and if there is a full time troupe, how many will there be in it? ETA13: Some good news and some bad news today (depending how you look at it and who are your favorite pros). @DWTSGossip is reporting Tristan is “in”, but, Gleb” is “out” (sad, I was hoping to see him back). So, what does this mean for the 6th male spot left? Will it be filled by a returning Pro (Louis? or did they change their mind and decide to make Maks a pro? ), a promotion for a troupe member (Sasha or Henry? ), or will it be someone entirely new? Penny for your thoughts! ETA14: Guess what Kids? @DWTSGossip says she got mixed up and Gleb is IN! YAY! ETA17: Heidi here to tell you that a few spots in Pro Watch may just be WRONG. Dead wrong. Sorry, that’s all I can say right now. We’re in for one surprise tomorrow and a couple other mild surprises. 😉 Maybe – take it with a grain of salt as usual when mysterious sources appear. Julian Tocker – Not dancing full time in troupe this season, but we’ll still see him around.